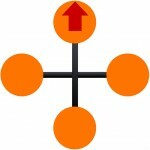 There are different quadrocopter configurations you should know about. The red arrow shows the flight direction. 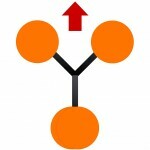 The X configuration is very popular. All our quadcopters in the trick videos are using this configuration. The plus configuration feels very similar to the X configuration. 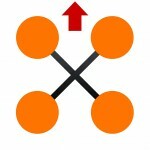 When you are performing a normal front or backflip it is actually a cross-axis roll like on the x configuration. Looks more like a tricopter but it is a quadcopter. Way less performance than the X or + configuration. Easy to see through the Y like shape. A little less performance than the X or + configuration but easier to see through the new shape. To be precise we actually have to talk about multicopter configurations on this page, because a multicopter is a quadrocopter when the motor count is 4. Besides quadrocopters there are tons of other configurations one can build. There are for example bicopters, tricopters, Y6 copters, hexacopters in X configuration, hexacopter in plus configuration, octocopters and more!